Known as the strongest blend in the Gran Habano portfolio, the Corojo No. 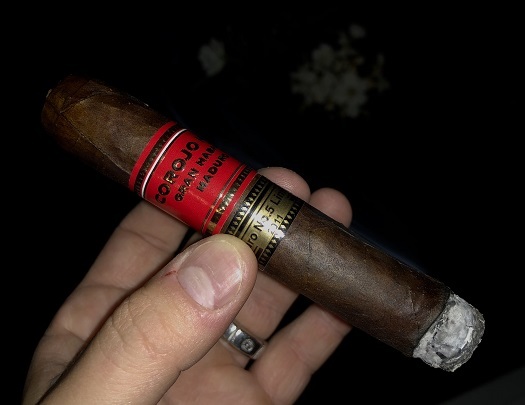 5 Maduro 2011 is comprised of a Nicaraguan Maduro wrapper around a Nicaraguan binder and filler tobaccos from Nicaragua and Costa Rica. The Robusto (5 x 52) starts with a full-bodied blast of espresso, roasted peanut, and cayenne pepper. It cools down considerably after the first half inch or so, yielding flavors like dry oak, dark cherry, and natural tobacco. The texture is bready and, at times, the taste shines with a sensation akin to moist chocolate cake. Solid construction and a $6 price tag make the Robusto easy to recommend.